1400 words / 7 min. Tweet Share An MSNBC report by liberal journalist Rachel Maddow strongly condemned the current Republican leadership in Michigan for not following the state constitution. Instead, Republicans have passed bills subject to “immediate effect” without the required constitutionally required two-thirds majority vote in both houses of the legislature. 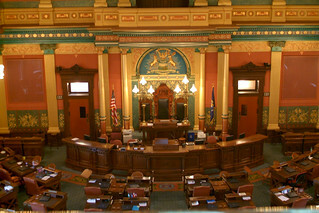 “Michigan House of Representatives Floor” by Flickr user “lincolnblues.” CC BY-NC-ND 2.0. An MSNBC report by liberal journalist Rachel Maddow strongly condemned the current Republican leadership in Michigan for not following the state constitution. Instead, Republicans have passed bills subject to “immediate effect” without the required constitutionally required two-thirds majority vote in both houses of the legislature. Should a state legislative body be insulated from judicial scrutiny of its “internal” processes? Is ignoring actual vote counts, and simply declaring something to have “immediate effect” sufficient to make it so in the state of Michigan? What is the relationship between the three branches of government? Although I am not a Michigan lawyer, I find it hard to believe that the separation of powers principle in Michigan truly prohibits a court from ruling on legislative actions. In fact, in less than five minutes of searching, I found court precedent in favor of my belief — on the Michigan Legislature’s own website, in their own description of Article IV § 27, in case called Frey v. Department of Management and Budget. First, what does Article IV § 27 of the Michigan Constitution say? No act shall take effect until the expiration of 90 days from the end of the session at which it was passed, but the legislature may give immediate effect to acts by a two-thirds vote of the members elected to and serving in each house. We hold that art 4, § 27, does apply to initiated laws enacted by the Legislature. Therefore, since the initiative was not given immediate effect by a two-thirds vote of each house of the Legislature, 1987 PA 59 may not go into effect until ninety days after the end of the session at which it was enacted. We affirm the decision of the Court of Appeals. Frey v. Department of Management and Budget, 429 Mich 315; 414 NW2d 873 (1987). The Republican appeal dismisses all of Frey as essentially meaningless to the current fact pattern, focusing on its relevance only to the issue of referendums, and ignoring entirely the core argument above (presumably deciding the referendum language was binding, but the immediate effect language was merely dicta). I find it difficult to ignore the language in Frey that a “two-thirds vote of each house” is required. Frey assumes the power of the Michigan courts to rule on legislative issues like two-third majorities, and Frey affirms the power of the courts to say when a law goes into effect. The Republican appeal fails to deal effectively with Frey. Without the check of the judiciary, there would be no true rule of law. The judicial branch exists because the legislative and executive branches — regardless of their own agreement, and regardless of the size of their majorities — must be checked. The solution to a court ruling on the constitutionality of an act is to change the constitution (but it’s hard to do that, unless you’re running an initiative in California). Arguing the merits of their process before the courts is proper. Telling the courts to “leave us alone,” and accusing a judge of acting “improperly” for interfering with the legislative process — that’s not the rule of law. Violating your own state constitution just because you’re the Republican majority is also not the “republican form of government” guaranteed under Article IV of the United States Constitution, either. More powerful in practice than Article IV, the Fourteenth Amendment prohibits the denial of individual rights by state governments. If the federal government were to be involved in the Michigan situation, it would likely involve arguments that House Republicans have denied “due process” and “equal protection” of the law to the citizens of Michigan. Additionally, the Voting Rights Act of 1965 — which considers parts of Michigan to be subject to extra scrutiny due to a history of civil rights violations — would give additional weight to federal intervention in Michigan. The Justice Department has the power to investigate under the Voting Rights Act. Citizens may also sue in federal court to enforce the Act. So far, this issue seems confined to Michigan state courts — but it may not stay that way. I argue, instead, that there is nothing “unreasonable” or “unprincipled” in the lower court’s decision, even if a more complete analysis of the law supports the actions of House Republicans. Legislatures should not be — even if they sometimes are — insulated from judicial scrutiny. Ignoring one’s own constitution is illegal and morally wrong. A judge ordering a preliminary injunction while a trial investigates that possibility is both reasonable and principled. And an order of mandamus essentially requiring legislators to follow their own constitution does not appear to be much of a burden — unless that isn’t already happening. Why can the TSA subpoena bloggers to get at their sources?